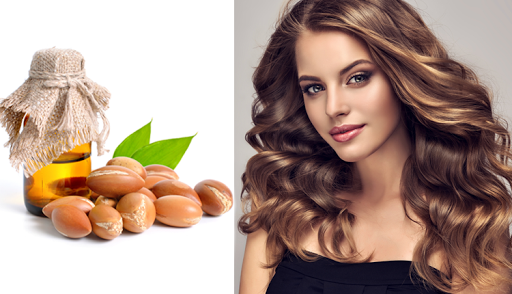 Below are benefits and common uses of argan oil. For generations, argan oil has been used to nourish skin, treat wound and relief rash and itch. It is gentle, safe to apply around the eyes and you can apply it directly to the skin without diluting. Skin moisturiser- Argan oil hydrates and softens skin. Nutrients present in it makes it an ideal skin moisturizer. You will find this oil non-irritating and non-greasy and do not clog pores. Also, it absorbs quickly. Oleic acid present in the oil assist the ingredients to penetrate and nourish the skin. To use argan oil as a skin moisturizer apply a few drops of oil on your skin and rub gently with your fingertips in a circular motion. Anti-ageing– Everybody wants to age gracefully. To reduce wrinkles and fine line argan oil is ideal. It is rich in anti-oxidants, restores the elasticity of skin and promotes collagen production. With regular use, your skin feels softer and plumper. Apply argan oil to your face and neck every night before sleeping. Promotes Healing- The antioxidant properties of argan oil heals cracked, irritated, burned and damaged skin. It promotes collagen production and speeds healing along with reducing inflammation and soothing pain. Moisturizes lip- Cold and dry winter winds leach moisture and make your lips dry, cracked and sore. Use argan oil as a lip balm to make your lips soft, supple and plump. Apply one or two drops of oil on your lips and wipe off the excess of oil. Removes Stretch Marks– Pregnancy makes your abdominal skin to stretch. After baby birth, you are left with sagging skin and stretch marks. Argan oil is rich in vitamin It increases skin elasticity and helps you eliminate stretch marks. Start applying a few drops of argan oil on bottoms, thighs, stomach and breast from the 4th month of your pregnancy to prevent the appearance of stretch marks. Also, it will keep your skin hydrated and healthy. Treats Acne- ‘Liquid Gold’ reduces inflammation, heals damaged skin, is rich in antioxidant and kills acne-causing This oil contains linoleic acid and oleic acid that aids acne-prone skin. It opens skin pores and cleans skin. Rub liquid gold gently two-time in a day to clear mild acne. Also, it will balance dry or oily skin. Eczema And Dry Skin Issues- Argan oil is very beneficial for people with dry, flaky and itchy skin and for those who suffer from skin issues such as eczema and dermatitis. It provides skin with essential nutrients such as fatty acids and vitamin E. It reduces inflammation, skin irritation, prevents dryness and soothes skin. Rub argan oil directly to the affected area two times in a day to encourage healing and provide relief. Effective exfoliant- For glowing and fresh skin, you need to exfoliate dead skin cells. Add 3-4 drops of argan oil to a tablespoon brown sugar and mix well. Scrub your face and neck with it gently in circular motion for a minute or two and then rinse with warm water. Exfoliate skin two times a week to eliminate dead skin cells and reduce wrinkles and fine lines. Good For Nail, Foot And Hand- Our ‘liquid gold’ has skin softening properties and is ideal for cracked feet and dry It hydrates skin, makes skin soft and supple and strengthens nail. Massage your hands, feet and nails with argan oil daily before going to bed. Skin Toner- Cleansing, toning and moisturizing are three essential steps of every day skin care regimen. You can make a natural toner at home with argan oil, essential oils and green tea. Steep a bag of green tea in a cup of steaming water for 10 minutes. Allow the tea to cool down to room temperature. Add 2-4 drops of argan oil and 1-2 drops of essential oil such as tea tree oil or lemongrass oil. Your natural skin toner is ready to use. Apply it in morning and evening after cleaning your face and then apply moisturizer. Treating Razor bumps- Not only razor bumps burn and are unsightable. After shaving, apply argan oil to soothe your skin. Not only it is effective for men after shaving beard but also for women who shave legs, underarms and bikini area. Pollution, poor diet, over styling and improper hair care damages hair shaft. Your hair becomes prone to breakage and split ends. Argan oil locks the moisture nourishes the scalp promotes hair growth and makes your hair manageable. Deep Conditioning- To treat brittle and dry hair deep conditioning with argan oil is effective. Wet your hair. Massage scalp with a few drops of argan oil. Before applying the oil to your scalp warm the oil in your hands. Leave it overnight. You may wear a shower cap to keep the pillowcase oil free. In morning shampoo as usual. Styling agent– It’s hard to digest the fact that oil can be used as a styling agent. But yes, argan oil has the property to tame frizzy hair. It makes hair manageable, gives it shine and holds hairstyle at the place. Before a blow-dry, curling or styling take 1-2 drops of argan oil over your palms, apply to your wet hair and then comb. Our ‘liquid gold.’ not only protects hair from heat damage but also creates a smooth finish. Other chemical loaded hair styling products make your hair feel greasy, lifeless and heavy. On the other hand, argan oil holds the style without being sticky, stiff and without losing hair volume. Leave in Conditioners- Rub a few drops of ‘Liquid gold” between your palms and comb the oil with your fingers from roots to tip. This natural homemade leave-in conditioner will keep your hair damage-free and moisturized. Dandruff Treatment– As discussed above argan oil is rich in antioxidants, vitamin E and essential fats. It reduces inflammation and prevents dryness. Protects Hair From Chlorinated Water And Sea Salt Water When Swimming- Chlorinated swimming pool water and even salty sea water has highly damaging effects on your hair. Before swimming, wet your hair and apply a few drops of oil from roots to tips. This acts as a barrier and protects your hair. After swimming shampoo, condition and dry hair with a towel and then apply 1-2 drops of argan oil pulling through bottom two inches of hair and then comb to distribute the oil. Sun Protection– Planning to spend some quality time in the sun playing with your kids apply a few drops of argan oil to hair to lock moisture and prevent hair damage. On using chemical loaded shampoos that steal scalp moisture many people suffer from dry scalp and dandruff. Use argan oil to treat dry scalp and dandruff. Warm argan oil and apply 4-6 drops of the oil to your scalp. Massage and wear a shower cap. Leave it for a few hours or overnight and then shampoo as usual. Repeat this two times a week. So after reading our article on the benefits of argan oil do not wait for long and grab the bottle of ‘liquid gold’ to reap its benefits. *Although argan oil is entirely safe to use if you have nut allergies be mindful and have a patch test before using it.